We have all heard them. Many of us have even said them. Those disparaging little comments about ourselves that we say when we think no one is paying attention. These are the words that I fear most. I fear them because I don’t want the girls to say them. I try really hard not to make them about myself. I try even harder to bust them when they say these things about themselves. I fear that they will think this is an acceptable and normal thing to do. I fear that their confidence will rely solely on thier outer beauty. If they judge their self-worth by how others view their outer beauty, I will feel like I failed as a parent. This is my biggest fear. 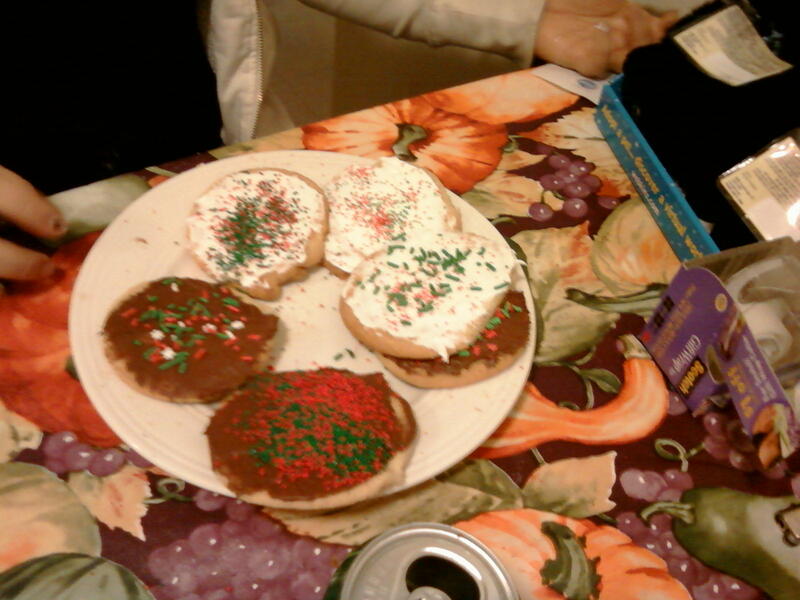 The Mother Hen: [WickedStepMom] you have to decorate cookies with us. You can’t leave that plate sitting over there with a bunch of naked cookies! The Show: Yeah, but now, there are four plates, and we can’t have a plate of nudist cookies. It’s just not right! 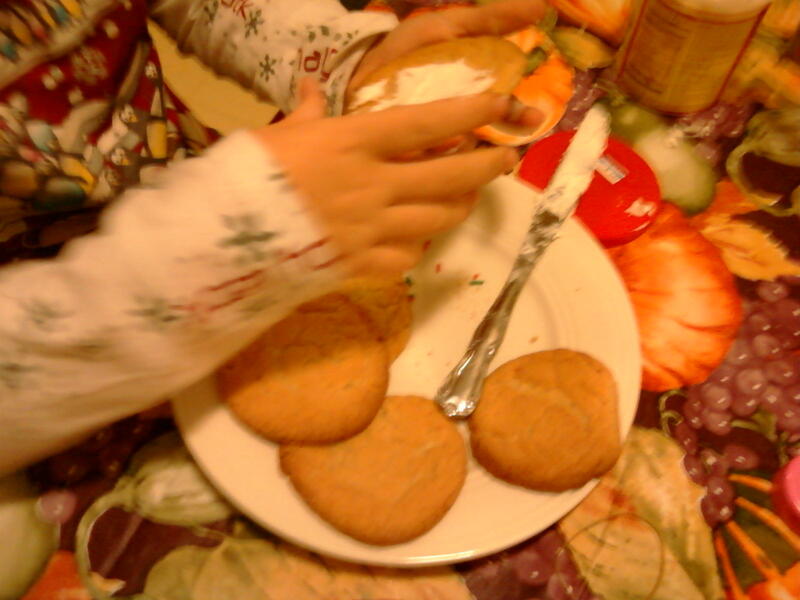 My entire holiday will be ruined because you have left the cookies naked! The Tyrant: Yeah, I mean, you will get our cookies arrested and they will have to spend the night in cookie jail. I don’t want to eat jail-bird cookies! Its Tuesday. It’s not So Random. It’s time for me to get some new jokes. Go see Keely… she is a comedic genius, and I am just a student. * The Gnome that has moved into my sinuses has gotten very comfy in there. He just won’t leave. Maybe the ENT doc will find a way to get him out. If not, I think it will turn into nuclear warfare… and that just won’t be good for society as a whole. I mean, who wants nuclear winter over my sinuses?… Yeah, I didn’t think that you did. So, you’re welcome. But if this goes on too much longer, it is on, Mr. Gnome! [Bear’s REALLY Annoying Co-Worker]~ said I was too “chipper” this morning and suggested that “If I didn’t know better, you got lucky!” I said luck had nothing to do with it…killing two homeless people with one shot is SKILL. ~Name changed to be more appropriate this his given name. * Bear, like my mother, has a very defined set of taste buds. He does not like to deviate from the normal. (And he wonders why I can’t get The Tyrant to eat another other than tacos…) I told him that I was going to take The Mother Hen out for some mediterranean food. Bear: Chickpeas are just peas that stay home and watch chick flicks with Hugh Grant in them. *The Tyrant looked at me this weekend, with daggers in her eyes. I wouldn’t let her have a new toy at the store (partly because I had already bought her stuff and partly because there has to be something under the tree). She stomped her foot and said, “Mommy is nicer than you.” I grinned, “She is also taller.” She just blinked at me. It has become kind of tradition for Bear to get me new boots during the X-mas season. I love this gift because all winter long, my feet are warm and dry. This may not seem like a big deal but when you living in Michigan and have questionable health anything that can keep you from getting sick, is the best thing ever. This year, in addition to my boots, he got me a balaclava. It’s a neoprene face mask that covers my nose and mouth. Since the cold air sends me into coughing fits, this thing totally rocks. I get a warm face and warm breath without the bulkiness of a scarf. It is really a win-win. The other day, Bear expressed concern that this was not enough for me. Some of his coworkers were commenting that woman like “romantic” gifts. And that she could be buying me jewelry not winter gear. This guys can take a long walk off a short pier. I happen to be allergic to most jewelry. (I know, go figure, right?) Nothing says romance like hives! I told him that I am very happy with my gifts. To me, keeping me healthy is better than a trinket that I can look at. It shows me he cares because he make sure that I am safe and warm. Maybe, I should have held out for organic ice cream? This year has been filled with a lot of ups and downs. As you know, The Mother Hen came to live with Bear and I full time. The Show and The Tyrant still spend 5 days a week with thier mother. Monday through Friday, it feels like we are not quite whole. On Friday night, while we are munching on pizza, the world is right again. All three girls have been doing well in school. There are some things that they are great at and some things that don’t come easily to them. But, we are proud of them because they never quite and they work hard at whatever challenges them. In the past year, it has been The Tyrant who has grown a lot. She has gained about 6 inches in height. It is hard to keep her in pants that don’t look like capris. The Show has joined side line cheerleading for the basketball season. So far, she seems to really enjoy it. I think it is all the years of gymnastics that are helping her to shine. The Mother Hen is still our song bird. She is very involved in choir and is getting ready for two upcoming concerts. Bear and I haven’t changed much. We are still both working with computers. We are both healthy and happy. Moving in together this year has brought a lot of changes for both of us but we are adapting to it well. The Tribe as a whole is better for it. We are all eating healthier this year. We have made it a point to have a lot of fresh fruits and veggies around the house. It is amazing that we all will go for the fresh fruit before the junk food. I hope this letter finds you healthy and happy this year! – Risking your life wouldn’t be brave, if people didn’t fear death. – Performing on stage wouldn’t be brave, if stage fright did not exist. – Going to a new school wouldn’t be brave, if you knew that you would have all new friends by the end of the day. – Trying a new sport wouldn’t be brave, if you already had the skills to do it. – Standing on a tall building or crossing a tall bridge wouldn’t be brave, if there was no chance that you could fall. Fear is what leads to bravery. Without it, we would never be scared to do anything. Without fear, no one can be brave. Everyone around me has been sick lately. More and more people are becoming germaphobes. They are cleaning, washing and using bleach like there is no tomorrow. They are cleaning their hands at least twice and hour. I realize as I look around, that people are starting to pick up on my daily habits of cleaning things and using hand sanitizer. I realize that I have been a germaphobe for a very long time. I also realize that I don’t mind that I am. I use to get sick all the time and now that I am a clean freak, I don’t get sick as much. So, the question is… am I a germaphobe or cleanly? And does it really matter? Here is my confession. We negotiate with our girls to get them to take medicine. We offer up treats and soda, trips to the dollar store and time watching their favorite shows. It works for us. There is no trauma involved and the girls take the medicine. I am sure that a lot of people would say that we are doing something wrong and that we should make the girls take the medicine or else! But, for us, it works. The girls will take medicine knowing that it is not a form of punishment. They know that even if it tastes bad, we are doing what we think is best for them. I think too often, we as adults, forget how horrible the liquid medicines tasted. And how when you are sick, the last thing you want to do is drink a mouthful of the grossest substance on earth.